Immediately upon arrival remove any foliage that will be below the waterline in your vase or arrangement; avoid injuring the stem bark. Please remove the water tubes or the foam wrap from inside the green plastic sleeve bag. Cut under water with a sharp knife or scissors. 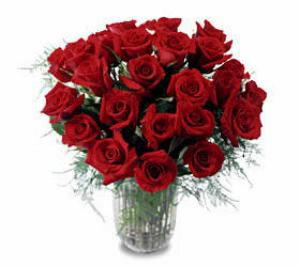 Place the roses in a clean deep vase or container (make sure you have added the Rose food) water should be room temperature. Condition roses in a cool area for 2-4 hours. To arrange, use a clean vase (not metal) with ample water capacity (roses are thirsty!). Keep the vase filled with water. Add water, do not change the water if you have put in the rose food. We at Hatcher's usually give two packets so you can change the water in five days. If you are arranging in floral foam, soak it first with the food and water together, insert the stems to the bottom of the container. Water daily, keep the foam saturated. Display the roses in a cool location, out of direct sunlight, avoid excessive heat or cold. Place roses in a location free from drafts. If a rose wilts, roll the stem and head up in paper making sure the head is vertical recut the stem about 2 cm and place in warm water for 3-5 hours this should firm up the rose. Place back in the vase with the other roses.